Garden design is a very personal expression and even at it's best, it is not an exact science. However, there are some guiding principles that will help you create a pulled together, cohesive look. As with playing an instrument, if you can learn these fundamentals, you can vamp whatever appeals to you. The basic principles of garden design are simple enough, however, each is often referred to by more than one name. The 3 categories below contain the basic elements that, when combined together, constitute the generally accepted version of good garden design. Keep in mind that it is your garden and you are the one who should be pleased with the results. Rules are meant to be broken. This refers to the basic structure of the garden. Order can be obtained through symmetry, as in a formal garden, through repetition of plants or colors, or through balancing bold or bright features with a complementary weight of fine texture or muted features (generally in a 1/3 bold to 2/3 fine ratio). What you don't want is a garden that looks haphazard, as though plants were plopped in wherever there was an available spot of soil. You don't have to put a plan down on paper, but you should consider where you want to place your plants before you start digging holes. As the terms imply, harmony or unity is when the parts of the garden work together as a whole. We've all seen gardens that feel like an assault on the eyes. That' happens when there are too many disparate elements. Harmony is achieved in editing. This can be accomplished by using a limited color palette, the repetition of key plants throughout the garden, The repetition of colors or structures, like round spheres scattered periodically through the borders, or by developing your flower bed around a clear focal point. If you've ever seen a themes garden, you've seen a garden with built-in unity, such as an all-white garden, a butterfly garden, or a Hosta collector's garden. Great structure and unifying elements will create a pretty picture, but your garden can appear static. To keep things interesting you need to keep the eye moving. That doesn't mean visitors viewing your garden should be darting their eyes about every which way. You want to slowly guide them through the discovery of your garden, by directing their gaze. You can accomplish this with gradual changes in height or color prevent, curves that can't be seen around until you get there, or intriguing focal points or seating areas that beckon. The transition can also be used to create the illusion of a larger space by creating depth as smaller plants flow back into taller plants. What you are striving for is to prevent the eye from making a sudden stop. 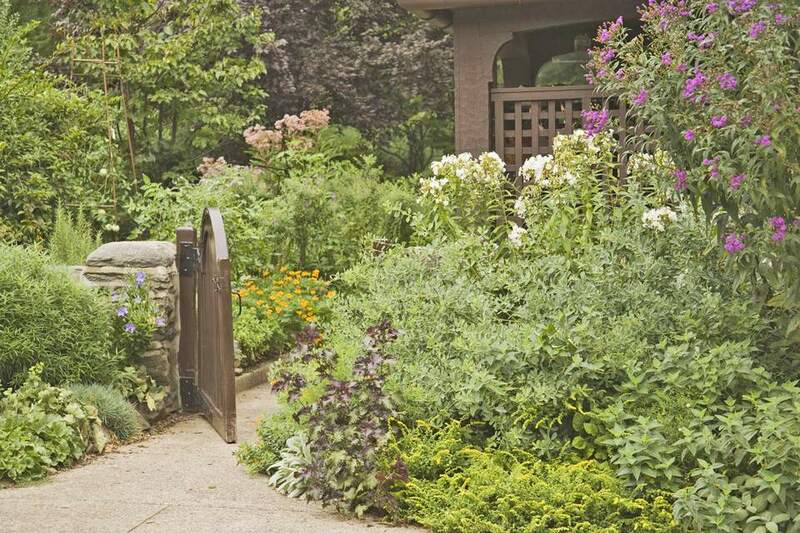 These 3 elements work together and should be ideas you play with, to personalize your garden. Don't let them paralyze you with the feat of getting it wrong. You can always move a plant somewhere else in the garden or even give it away and try something new. Once you get the garden design basics mastered, you can add even more elements like fragrance and sound. And all gardens are a work in progress, so don't be afraid to play.